Al Khwarizmi was an Islamic scholar of Persian descent born at the end of the 8th century. Very few details are known about his life but we know that he was a talented mathematician, astronomer and geographer. Conflicting accounts of his life have been given by different historians. He could either have hailed from the city of Khwarezm in Iran (now part of Uzbekistan) or his forefathers may have come from Khwarezm while he himself belonged to the city of Qutrubbul in Iraq. Similar confusion exists about his religious beliefs. He was generally known to be a staunch Muslim but some accounts suggest that he was a follower of ancient Zoroastrian beliefs. Al Khwarizmi lived during the Abbasid caliphate and worked at “Bayt Al-Hikma” or “The House of Wisdom” established in the year 832, by the Caliph Al Ma’mun, son of Harun Al-Rashid. This was an establishment of learning, where prominent scholars wrote original treatises, researched and translated existing texts (such as Greek philosophical and scientific volumes) into Persian. Al Khwarizmi had a flourishing scientific career at the House of Wisdom, where he wrote several important books. One of the most important was “Al-Kitab al-mukhtaṣar fi ḥisab al-jabr wal-muqabala” better known as “The Compendious Book on Calculation by Completion and Balancing”. This was translated into Latin in the 12th century and the title of this book is where the word “algebra” takes its root. In this book, Al Khwarizmi demonstrated the method of solving first and second degree polynomial equations and other basic algebraic techniques but the crux of this work is its practical application in resolving everyday business matters in the fields of trade, land surveying and legal inheritance. The basic purpose, therefore, was for it to serve as a practical guide rather than a theoretical text. Nevertheless, it is the first text on algebra and served as the foundation of knowledge in this field for centuries to come. The term “algorithm” owes its origins to Al Khwarizmi as well. His name was sometimes Latinized as “Algoritmi” and one of his books was translated into Latin as “Algoritmi de numero Indorum” (or “Al Khwarizmi on the Hindu Art of Reckoning”). This eventually took hold and the name of Algoritmi became synonymous with the mathematical term algorithm. This book is noteworthy in other ways as well, as in it, Al Khwarizmi introduced the Arabic system of numbers and described the concept of zero. This concept had been introduced in Indian texts much earlier, Al Khwarizmi further described and perpetuated the system. This is a significant accomplishment as it offered a much better alternative to Roman numerals, which had no place value and no concept of zero. Eventually these ideas were adapted in all of Europe and the rest of the world. Al Khwarizmi made many relevant contributions to the field of geography as well. He enhanced Ptolemy’s research in geography by adding to it his own knowledge from the original study he had conducted. He also put together a map of the world as known at the time, by supervising and compiling the work of 70 different geographers. These maps were later translated into Latin and were a profound influence on geographical knowledge in the West. Al Khwarizmi improved the construction of sundials, which were placed on mosques to more accurately observe prayer times. He also invented the shadow square, which was an instrument used to determine the height of an object. He wrote several important works on astronomy such as the position of sun, moon and planets, calendars, astrological tables, eclipses etc. 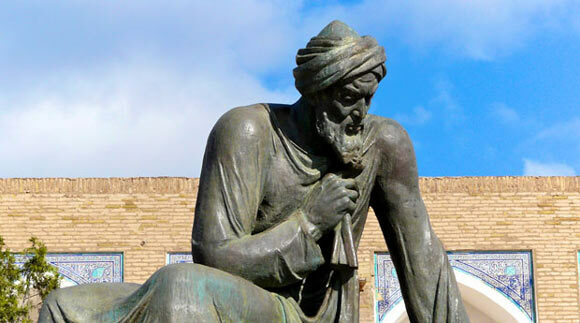 Al Khwarizmi is thought to have died around 850 and is ranked as one of the foremost mathematicians of all time.